At some point in every project, we are asked, “How does this product/service create value for our customers?” or better yet, “How might we create value for our customers?” Customer Journey Maps are well suited to answer these questions. 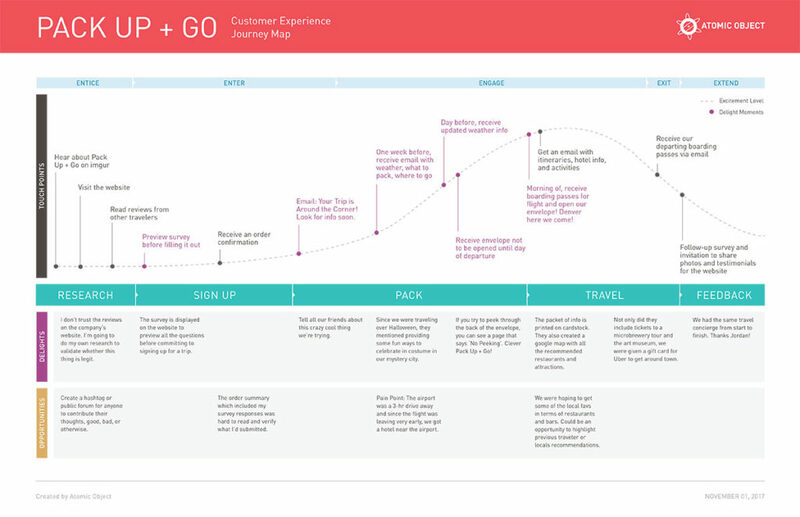 A Customer Journey Map helps to identify key points in an experience where your product/service may be used and show how it might create value. Journey Maps should be written from the users’ perspective and can be developed by observing users first-hand or by documenting a first-hand immersion (moving through an experience yourself). If you have the advantage of compiling several Customer Journey Maps, you’ll get an even more thorough look at the experience and be able to identify patterns across various users and personas. Customer Journey Maps are so powerful because they integrate several layers of information to tell the story of an end-to-end experience. Start with how the experience is going to organized. I’m a fan of the 5E Framework. Entice – How is someone attracted or made aware? Enter – How does the user begin? Engage – What is the core of the experience? Exit – How does a user complete or finish the experience? Extend – What happens after the experience? Define the steps the user moves through from start to finish. What are the touchpoints or key moments that happen during the experience? Group the activities from Step 2 into phases. This creates common language about what it means to engage during each phase. You may also find that phases align closely with the 5E Framework. If they do, be descriptive of what’s really happening. Detail and describe key moments of the experience (highlights, pain points, moments of delight, and opportunities for improvement). To provide an example of a complete Customer Journey Map, I’ve documented my recent experience with Pack Up + Go, a surprise travel agency that plans three-day getaways. Not only does this example detail the key moments, but it also goes into depth on what made it a positive experience and where I, as the user, see opportunities to make it even better. Persona Profiles – What does a user do, think, say, or feel throughout an experience? Loops or cycles within an experience where things are repeated. Service blueprint information such as what’s front stage (what the user sees) and back stage (what process or systems drive the experience). Time – How long is the whole experience and/or phases of the experience?